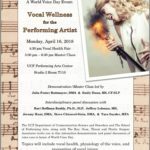 Description: The University of Central Florida Department of Communication Science and Disorders and The School of Performing Arts, along with The Ear, Nose, Throat and Plastic Surgery Associates invite you to this interactive demonstration and panel discussion of voice care in honor of World Voice Day. 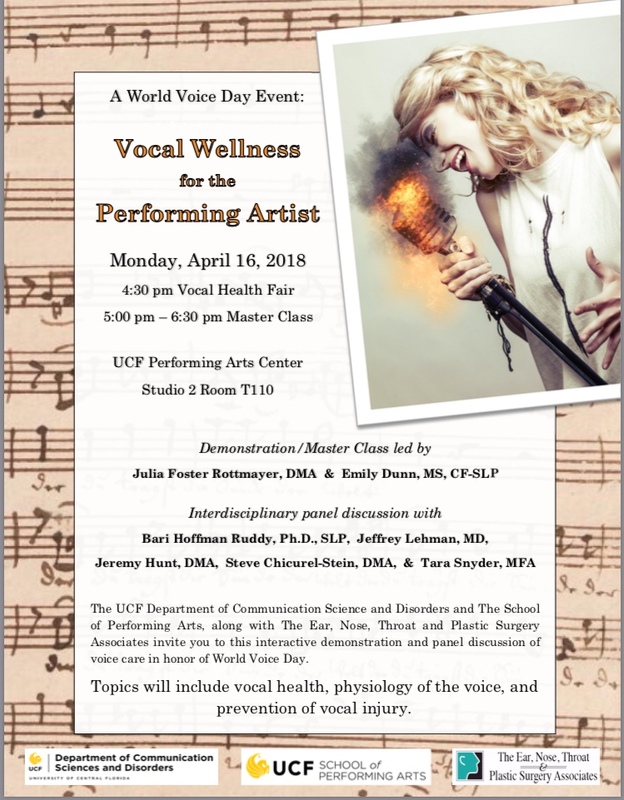 4:30-5:00 pm - Vocal Health Fair 5:00-6:30 pm, Demonstration / Master Class led by Julia Foster Rottmayer, DMA, and Emily Dunn, MS, CF-SLP, and interdisciplinary panel discussion with Bari Hoffman Ruddy, Ph.D., SLP, Jeffrey Lehman, MD, Jeremy Hunt, DMA, Steve Chicurel-Stein, DMA, & Tara Snyder, MFA. Contact: For more information, contact Julia Foster Rottmayer at jrottmayer@knights.ucf.edu.